Edward O. Wilson—winner of two Pulitzer prizes, champion of biodiversity, and Faculty Emeritus at Harvard—is arguably one of the most important thinkers of the twentieth century. 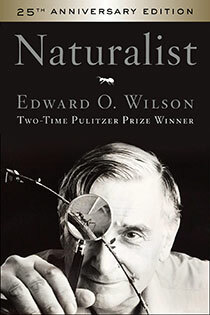 A modern classic of science memoir, Naturalist is a wise and personal account of Wilson’s growth as a researcher and the evolution of the fields he helped define. Wilson traces the trajectory of his life—from a childhood spent exploring the Gulf Coast of Alabama and Florida to a career as a tenured professor at Harvard—detailing how his youthful fascination with nature blossomed into a lifelong calling. As the narrative of Wilson's life unfolds, the reader is treated to an inside look at the origin and development of ideas that guide today's biological research. At once practical and lyric, Naturalist provides fascinating insights into the making of a scientist, and a valuable look at some of the most thought-provoking ideas of our time. As relevant today as when it was first published twenty-five years ago, Naturalist is a poignant reminder of the human side of science and an inspiring call to celebrate the little things of the world. Download Chapter 4: A Magic Kingdom here or read it below.